Apple is holding an event on Monday, March 21, at their Cupertino campus location, according to invites sent to selected media members (us not included). 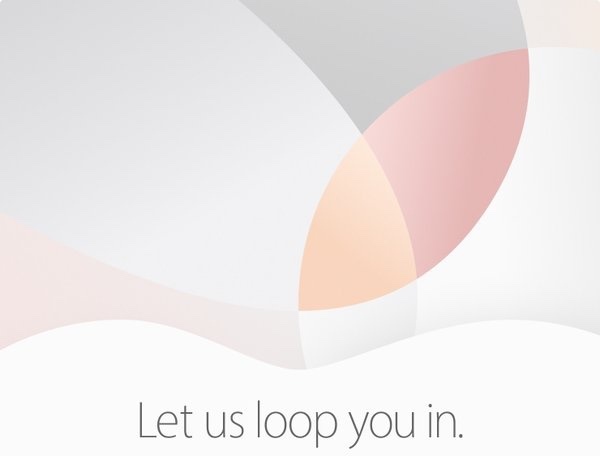 The invitation email reads “Let us loop you in” and features the top of an Apple logo with space grey, silver, gold, and rose gold pastel shapes. Several new products are expected to debut at the Apple event, including a revised 4″ iPhone, a revised iPad 9.7″, and a variety of new Apple Watch bands. System software updates are also presumed to arrive as well. The revised 4″ iPhone is colloquially referred to as the “iPhone SE” and is said to be similar to the iPhone 5s in size and appearance, except it will be faster and have internal component improvements. Additionally, the device will have Apple Pay support, according to Buzzfeed, which is also where the above invite picture came from. The revised 9.7″ iPad is supposedly going to adopt the “iPad Pro” moniker and feature notable hardware specification improvements, similar to the larger 12″ iPad Pro already on the market. New Apple Watch bands are likely to come in a variety of new colors and materials, but the Apple Watch itself seems likely to remain unchanged. Multiple updates to system software are also expected to debut on the same day, with the final versions of iOS 9.3, OS X 10.11.4, WatchOS 2.2, and tvOS 9.2 expected to be released as well, after having been in beta testing for several months. Some wildcard rumored products that are less likely to be unveiled but remain vaguely possible include updated Mac hardware, and the long rumored Retina version of the Apple Thunderbolt 27″ display. The March 21 event will be livestreamed on Apple.com here for users visiting with the Safari web browser. The keynote speech begins at 10 AM PST. I am completely bored with iPad and I would never buy another one. The iPad I did buy collects dust. It’s a good PC replacement for little kids and grandparents, but the iPad is useless for real work. You need a cursor, a mouse, and windowed apps, that’s all there is to it. I am somewhat interested in iPhone 7 even though the rumors are pretty boring right now for it. I would never buy a tiny iPhone SE with a 4″ screen with weaker specs. I am a pro user, I want pro hardware. I have no interest in Apple Watch, I tried one for a while and it’s basically Notification Center on your wrist. It is not for me, but at a $250 price I can see the attraction to some people. At $350 it is too expensive. New Apple Watch bands? Come on. I am VERY interested in new Mac hardware, a Thunderbolt Retina display, and a beefier Intel Skylake MacBook Pro laptop with 32GB of RAM and 1TB SSD perhaps with a modernized enclosure. I would love to see a legitimate update to the Mac Mini. The Mac Pro is basically dead in the water which is disappointing, they should have kept the tower model around and allowed for expansion. The iMac remains very popular with designers and developers at work, fortunately that is Retina display now. I have work to do, I want better work tools. That means better Macs, and better Mac displays. Stable operating systems. I do not want anymore toys and gadgets, or buggy OS updates. Is this too much to ask? It feels like Apple is abandoning the pro user, and it is disappointing. Except I do find tablets useful, mostly for web surfing/news reading (I do use an android one). But I really need to change my MBP badly, and will be truly pissed off if no skylake update is announced. Oh, please. Does a non-professional phone limit you to non-professional calls, text messages, and voicemails? Can’t run your enterprise apps going forward? Nothing but a modernized enclosure will do! >I have work to do, I want better work tools. Better MacBook Pro or bust. Lenovo Carbon X1 2016 model looks awesome and the price is a steal. Come on Apple… rock my world. Well, unfortunately, there seems no business in making pro hardware anymore, it is better to make cheap iPhones and sell millions of it, than make an extensible mac pro, which would be bought once per 10 years. However, Steve knew how to make the best of both worlds. What I would love to see from Apple, and admittedly it may be swallowing their pride a little, is an iPad Pro running OS X. That would be a perfect device. Similar to MS Surface, HP Spectre x2 etc. I must agree on Steven. An iPad Pro with OS X is mandatory or iPad users will start moving to MS Surface – and after that back to MS Windows. We want a Mac/iPad ecosystem that’s productive. Not just fancy and design perfect. Don’t underestimate watch bands. It’s rumored that they can serve as sensor points for users interested in collecting health/exercise data. P.S. Maybe the new 4″ iPhone will have the FBI/NSA tracking and unlocking software already baked right in!